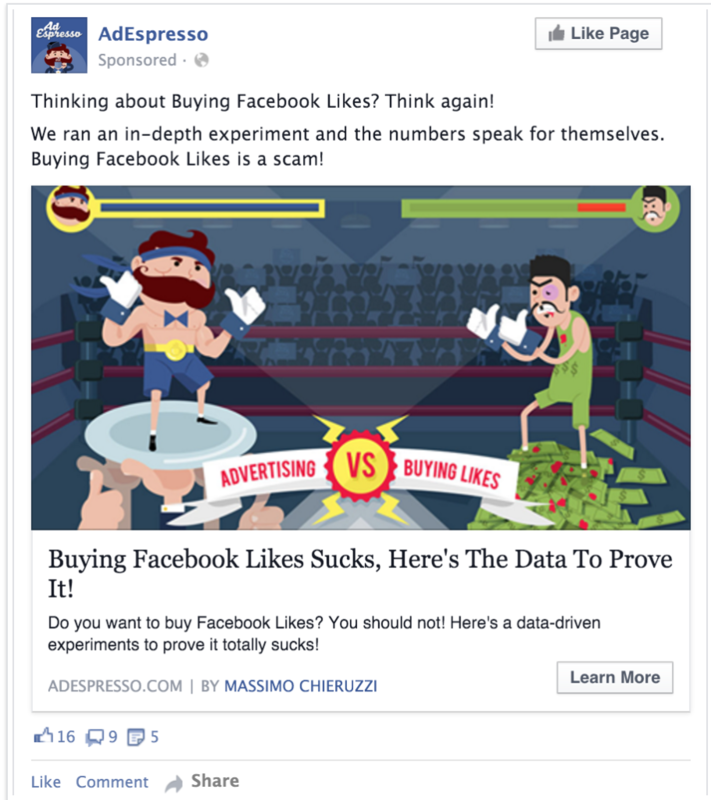 Social Ads and Fake Clicks: Truth or Myth? You are here: Home / Blog / Social Ads and Fake Clicks: Truth or Myth? Facebook Clicks are all Fake! Twitter is full of bots! This woman is where all of your clicks are coming from! You’ll have read all these claims about fake traffic all around the web, normally from some disgruntled advertiser who spent hundreds of thousands of dollars on an ad campaign only to find it wasn’t the panacea to all his problems. We’ve read all these complaints as well, and they just didn’t ring true. We know that Facebook ads can work really well, so whenever we read these articles we’re always skeptical and want to see the numbers behind these campaigns. Of course, advertisers that are failing don’t want to be scrutinized so don’t release their data. Therefore we went out and got our own. This week we did what we do best here at AdEspresso—we ran an experiment to test in a data-driven way if Facebook, Twitter, and Linkedin are really all useless and only driving fake clicks. The results surprised us as much as they’ll surprise you! The experiment itself was as simple as it could get. We decided to do the public a service and promote our old and very successful post detailing why you should never buy Facebook Likes. Each of the ads for each of the channels had the same image. Though each network has different limits for the text, we also aimed to keep the copy as consistent as possible between the channels as well. Each ad linked to Bit.ly and then was redirect to our website, setting the UTM tags in the URL so that Google Analytics knew where all the traffic was coming from. This way we were tracking the number of clicks through multiple sources and were able to compare and contrast the metrics at multiple stages. The channel’s metrics—The number of clicks the internal metrics from Facebook, Twitter, and Linkedin said that we received on each ad. Bit.ly—The number of times each Facebook, Twitter, or Linkedin specific bit.ly URL was called. Google Analytics—The number of visits we had from each of Facebook, Twitter, or Linkedin according to our internal Google dashboard. Our Webserver’s logs—The raw data showing each individual visit to our site from Facebook, Twitter, and Linkedin. Don’t consider these numbers as an indicator of how well each channel works. This is about fake clicks, not about which channel you should use. We’ll be running plenty of experiments into that in the future. Based on the kind of content you’re promoting and your audience, you’ll see very different results. This is a small scale experiment. If we were doing this properly to look into the efficacy of different channels, we would be testing the ad images, copy, and targeting, and we’d put more money in to get more traffic. OK, enough words, now numbers! We were looking for the answer to this simple question: Were we flooded by worthless bots and pouring our money down the drain? No! In fact, we found the opposite. That’s the simple answer. Though this was a small scale experiment and the results weren’t astronomical, we actually ended up receiving more traffic than we paid for! 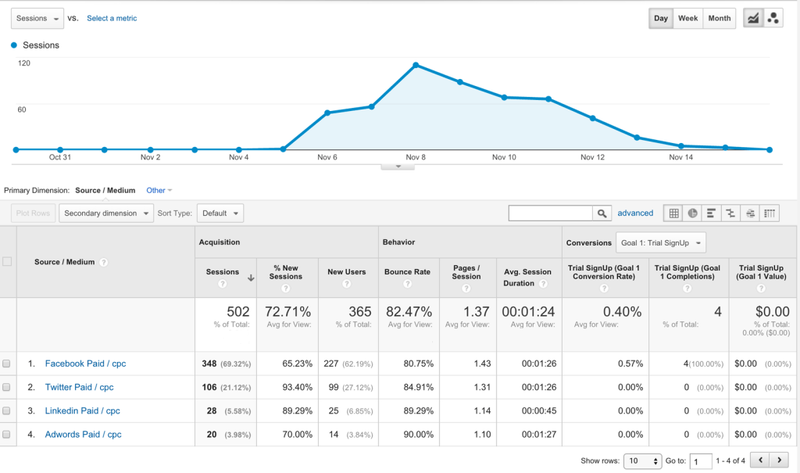 This is without optimizing our campaign, going deep into targeting, or any further testing. So let’s start looking at the results. Let’s start right at the beginning. Approximately the same amount was spent in each channel, so how many impressions and clicks did our ads generate, according to the metrics from each individual channel? We got by far the most impressions from Twitter, accounting for 53.7% of all the impressions our ads received. Facebook received the second most with 38.3% of impressions, and Linkedin was a distant third, with just 8% of all impressions. However, our Facebook ad received over double the number of clicks our Twitter ad received, and over 6X the amount of clicks the Linkedin ad got. Therefore the clickthrough rate (CTR) for Facebook was the highest at 0.78%. With its small clicks matching its small impressions, Linkedin was second with a CTR of 0.62%, and Twitter the distant third place this time with a CTR of 0.26%. Though Facebook seemed to have performed well with the highest clickthrough rate, that wasn’t the objective of the experiment. We wanted to see whether those clicks were genuine or fake clicks. So are all those clicks coming from bots or click farms? To find out about all these fake clicks we need to start looking at our own webserver logs and at bit.ly. If we chart that data, we can start to see what is going on. In the case of both Facebook and Twitter, Bit.ly is reporting more clicks received than the internal channel metrics. What’s more, our own server logs reported even more clicks! In each case, our server logs are reporting over 2.5X the amount of clicks than any of the internal metrics are. 184.73.124.118 - - [06/Nov/2015:04:51:25 +0100] "GET /r/LikesFb HTTP/1.1" 200 1156 "-" "bitlybot/3.0 (+http://bit.ly/)"
67.202.6.32 - - [06/Nov/2015:04:51:25 +0100] "GET /r/LikesFb HTTP/1.1" 200 1136 "-" "bitlybot"
46.236.24.52 - - [06/Nov/2015:23:37:54 +0100] "GET /r/LikesFb HTTP/1.1" 302 797 "-" "Mozilla/5.0 (TweetmemeBot/4.0; +http://datasift.com/bot.html) Gecko/20100101 Firefox/31.0"
46.236.26.103 - - [06/Nov/2015:23:37:54 +0100] "GET /r/LikesFb HTTP/1.1" 302 797 "-" "Mozilla/5.0 (TweetmemeBot/4.0; +http://datasift.com/bot.html) Gecko/20100101 Firefox/31.0"
209.133.111.215 - - [07/Nov/2015:00:16:30 +0100] "GET /r/LikesFb HTTP/1.1" 302 841 "-" "rogerbot/1.0 (http://moz.com/help/pro/what-is-rogerbot-, rogerbot-crawler+shiny@moz.com)"
OK, Bots do exist. We can see them from Datasift (checking out our page 330 times! ), Bit.ly’s bitlybot, and rogerbot from our friends at Moz. This brings the traffic down to a more reasonable level. The traffic numbers sans bots closely resemble the bit.ly clicks, and it seems that all the non-bot traffic was coming from unique IP addresses. This is incredibly important. When we see that the vast majority of our traffic was coming from unique IP addresses it means we can start to be confident that it is real traffic. At least 90% of our traffic is coming from these unique IPs. We also looked into the unique Class C addresses. An IP address looks like this: 192.196.0.1 composed of 4 numbers. You can find out your IP address by simply googling “what’s my IP?” Class C are the first 3 numbers of that IP Address (192.196.0). It’s because devices that are connected to the same router or server, and therefore in the same room or office are likely to share those first 3 numbers, and only the 4th number will change. The first computer will be 192.196.0.1, the second device 192.196.0.2, and so on. These sequential IP addresses are exactly what you’d expect to see from bots or a click farm where numerous computers are connected to the same local network. This is exactly what we don’t see. Because most of our traffic was coming different IPs we can be extremely confident that this was natural traffic. The chance that those were fake clicks, coming from bots or click farms is incredibly thin. A constant complaint that we hear is that the numbers in Google Analytics is much lower than Facebook reports. But that isn’t what we have found in our experiment. With both Facebook and Twitter we actually saw more traffic on Google Analytics that we initially saw on the internal channel metrics. With Facebook we saw 60% more traffic in Google Analytics than on Facebook itself. Only with Linkedin did we see few Google Analytics sessions than clicks reported in the internal metrics. With the sole exception of LinkedIn, Google Analytics is reporting more visitors than the advertising platforms are. This is the exact opposite of what everyone thinks happens. There is supposed to be some great fraud going on, but as this data shows, if anything Facebook and the other social advertising channels are under-reporting the amount of genuine traffic they are sending your way. When looking at the bounce rate, it’s not quite as low as we are used to, but they aren’t incredibly bad rates, and definitely good for an unoptimized ad sent to a cold blog post. What’s more, these visitors aren’t leaving in just a few seconds as you’d expect if they were fake clicks. The average time on site from Facebook and Twitter was over a minute (1:26), suggesting that people were actually reading the post. So why are all our numbers—bit.ly, our webserver, Google Analytics—so much higher than those reported by the internal channel metrics? Because these channels are already doing a good job of filtering out the bot numbers. All the bots that we found crawling about our webserver logs had already been discounted by the social advertising metrics. They’re not perfect, but they understand that people don’t want to count bots and fake clicks as genuine traffic, so are getting rid of them from their numbers. You, as the advertiser, are not being charged for what Facebook, Twitter, and Linkedin thinks are fake clicks and bots. However, that’s not the end of the story. Bots are usually not counted by Google Analytics, yet that system is reporting more sessions that Facebook. The numbers you see if Facebook, Twitter, and Linkedin are the number of clicks that have specifically been generated by the ads, and are the clicks that you’re actually paying for. But once you post content to a social network suddenly its reach grows far beyond that initial ad. If the ad is good, and as importantly, if the content is good, people start to like the ad, comment on it, and share it. The story we promoted, a study on fake likes, is one our our top performing blog posts, and users on each of the social networks engaged with it, sharing it with their friends and around their networks, generating organic, free traffic. Even after the campaign was over, when there were no more ads out there on any of the social networks, Facebook and Twitter still sent 75 more visitors to the page. These are users that saw it shared earlier, bookmarked it and wanted to read it later. All of these people complaining about fake clicks are missing the point. You shouldn’t care about clicks, fake or otherwise. Even the most genuine of clicks are useless if they don’t convert. You should be using social advertising to grow your business, and you can only do that if the people who visit your site through these sites convert to customers. So did these social ads lead to conversions? Facebook was the most effective channel, with over 15% of all visitors converting, either signing up to the newsletter, downloading and eBook, or in 4 instances, starting a trial with AdEspresso. That’s 34 people moved further down our funnel from a simple, unoptimized Facebook ad campaign. Remember, we weren’t promoting AdEspresso, or driving traffic to a landing page—the visitors were going simply to a blog post. From there, a total of 10 visitors went further and downloaded one of our eBooks, and a total of 28 ended up as newsletter subscribers. This is what is important. Not fake clicks, not any clicks—just conversions. Fake clicks are not the dramatic problem people claim. Yes, when you use social advertising, some bots or fake clicks will get through the net and you’ll end up paying for some of these. But it is nowhere near as big an issue as all the conspiracy theorists will have you believe. So why do they perpetuate this myth? In some cases it’s because they don’t really understand how this advertising works, have made mistakes and want to blame anyone but themselves. Other commentators no exactly what they are doing and are using the issue to drive traffic to their own posts telling you how terrible the problem is. You shouldn’t care about fake clicks. For one, they are not the problem people think, and two, what you should really care about are conversions and return on investment, ROI. If customers coming through are converting and you’re able to make money from customers in that channel, then it’s working. If not, whether it’s because of fake clicks, bad ads, or inefficient targeting then you need to leave the channel or improve your campaign. If it works, pump more money into that channel, it not then find another channel that will work for you. But don’t blame it on fake clicks! This is the end of our first AdEspresso University study. 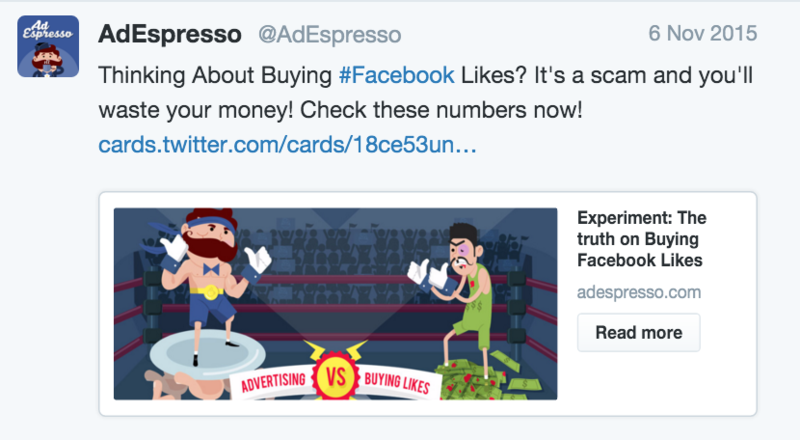 Each month AdEspresso University we will be running experiments looking at all aspects of social marketing, from whether your clicks are fake, to how often you should run your campaign, to what bid to use. The results will be published at AdEspresso University 1 month before they appear on this blog, giving University members advance access to the best online resources for improving all their social marketing. Every month we’ll spend $1,000 to run these tests and find answers. We’ll partner with one of our University members, running the tests with them, giving advice, and promoting their business. For only $19 per month, AdEspresso University members will get early access to all these experiments, along with a plethora of courses, tools, and examples to boost their social marketing and grow their business. Did you have the Tor (anonymity network) in mind? I would use it for fake clicks. A list of current exit-Nodes / IPs could be found here (http://torstatus.blutmagie.de/) if some of these adresses are in your List of IPs I would guess that these are bots. Good point! I’ll check our servers’ log against that list today. However if I had to seriously run bots for some reason I’d likely go with proxies or vpn rather than tor. There are vendors selling at relatively cheap prices proxies or VPN with thousands of endpoints in every country. I have a shopify store and i pay per click and my clicks always come from Facebook headquarters. Menlo Park. I’ll get 1-2 visitors to my site per minute then suddenly get 15 all from Menlo Park and my facebook ads bill shoots up and they always come and go from my site at the same time. I have photo and video of this happening non stop. Any advice? We need more quality data like this. Awesome job, Andrew Tate & AdEspresso. Can I make a request? I want to see this same style of report done for leads. How well do leads from FB convert (paid products)? How responsive are they on your email list vs. existing subcribers? Etc. Wow… it’s all about conversion. There is this myth about clicks that gets us destructed from the ultimate goal. How did these compare to your averages for similar promotions? This was pretty expensive compared to our campaign. The “Buy Likes” post is a very engaging one but is not optimized to get leads or generate conversions. * Lead nurturing of emails via email and follow on campaigns. Interesting test guys! Unfortunately from my own experience and analyzing a 1 year (large ecommerce) dataset, my conclusion is that Facebook is CONSISTENTLY over-reporting clicks to site. So I’m still in the “what everybody says” camp. However, I agree that a strong focus on ROI and business growth, tied to an acceptance of working with relative data, generally overcomes this problem. Facebook Ads really do a great job. Instead of worrying about fake clicks, I advice clients to dig deeper into the “retargeting-video-carroussels” kind of stuff, and focus on audiences not likes or clicks. Hey Filip, thanks for sharing your experience. Click reporting is for sure a big issue and the results we had in this experiment were for sure heavily influenced by the kind of content we promoted… a pretty popular blog posts that usually get a lot of engagement so the social component played a big role. For ads more “sales-oriented” the numbers are usually the other way around 🙂 Still … as long as the ROI is good… it’s worth the pain! Filip, you’re right that Facebook still over-reports. But how do you expect to showcase the right RoI when the “i” part of RoI is inflated? Facebook doesn’t just over-report, because it charges what it reports. So each of those objectives that Facebook _says_ is achieved is also being billed. Andrew Tate, thanks for running the experiment – but like Filip, I see ourselves and the large majority going through the same problem. Can you do this analysis by device types? I am not surprised if this is the case with desktop traffic. Mobile is where the sessions get lost. 1. What is the Avg. Session Duration for the visitors? Our internal testings shows 95% of Facebook users have less than 1 sec duration. More than that, we’ve played-back the rest of the recorded Facebook sessions, only to find out a lot of weird ‘robotic’ movements (mouse moving in straight lines, etc) on our landing pages. 2. The three platforms differ from one another in the audience segmentation. Therefore the efficiency could be different, as the audience is not segmented the same. This point must be highlighted through the report. I have “screen recording” software on my website. I can “play back” a users session and watch them use my website. I recently started advertising on facebook, and I can honestly say, checking your logs like this is not enough. Once you OBSERVE a playback of your users, you quickly realize they are not actually users. Ad Espresso definitely counted a whole bunch of bots as humans because they didnt verify. Ive seen the same thing, the facebook clicks lead to robot like behavior where it stays for 1-3 seconds and leaves, or “looks at the page” using really weird, unhuman movement. They will also come to the page, and then just immediately open another tab and browser other sites for a while, then briefly come back to your tab and exit. Its like someone is literally trying to simulate facebook users, but poorly. Finally, I can say without a doubt well over half the clicks I pay for are like this, probably closer to 80%-90%. Im glad I had the screen recording on, or I would have been fooled by the logs again. I suggest Ad Espresso trash this experiment, and try again with screen recording software. So far, im definitely being ripped off by Facebook. Jimmy, this is EXACTLY what has been happening to me. I also use screen recording and sure enough, the behavior is definitely not human. I have half of my site clicks doing the exact same thing. They sit still for 30 seconds, scroll for a second and are gone. This happens over and over and over. Yet, when a person comes to my site the engagement is drastically different. I am very frustrated that for more than 2 months I have been getting hosed by Facebook with their click bots. I tried reaching out and no response to date. This is devastating stuff to small businesses like mine. I recently installed screen recording software (hotjar) to better understand what users are doing on our commence site. I see the same robotic usage from Facebook traffic. It opens your page (from a product carousel) scroll down to the Footer, wait for 20 – 30 seconds, go back up and exit. Not reading the product information, or looking at pictures, but just study our company adres for 95% of the session. I also do not concur with the conclusion that, because the IP’s are unique, they must be humans or not part of a click farm. IP spoofing is very easy to do, especially if you have a user database with 1.5B unique IP’s in it…. Facebook apps on mobile devices appear to ping ad sponsor websites every 30 seconds or so while ad is displayed regardless of whether user clicks on a site. Your “data” doesn’t account for this. Don’t be so quick to dismiss fake clicks. You already know it occurs. What is lacking is an accurate measurement and assessment of the scale. It is very flawed to assume that unique IPs means real humans are generating the traffic. Viruses from computer worms can commandeer hundreds of thousands of computers at unique IPs and then be fed the URLs to click. It is not uncommon for the fake side of the internet to engage in targeted DDOS attacks from such resources using their ‘unique’ IPs over a few days, or even do so, where most of them have spoofed (masked) the target server from their actual IP with a fraudulent IP. To do the same for ad clicks is trivial. The rest of the story is the engagement part, which it does not appear that you have measured accurately. You had some engagement, but that does not indicate what you do not know and are not seeing. For all you know, half the entire basis for the ad traffic could have been generated by a single click farm. Ever heard of the Turing test? Apply that in this context. But facebook still takes my money. Don’t you think these are fake clicks? This is some good information, Andrew. Thanks for posting! One thing I’d like to note is that we have created some Dynamic Ads on Facebook, and when we save the ad (even before publishing it), we see traffic coming to our site with the UTM parameters we used with that ad. That tells me Facebook has bots that go out and probably do quality checks on the links included in ads. In our case, those bot visits are always 100% bounce rate, 0:00 avg time on page. Each time I saved an ad, we got more bot hits. All the hits were from the “Operating System” of “Linux” and registered different screen resolutions. I haven’t been able to fully put together what this means, but the fact remains that Facebook is using bots to hit links included in ads. Secondly, I wanted to mention the section of the post that talks about IP addresses is a bit confused. If multiple computers are using one internet connection, they will all appear to web servers as the same IP address. While each individual computer may have a local IP of 192.168.0.1 or 192.168.0.2, those are not visible on the web. Let’s say a router has the IP of 209.197.1.1 – both computers connected to the router will show up as 209.197.1.1 when they browse the web. I have to respectfully disagree with the conclusion of the article. I have advertised on Facebook for one year. Last May my website engagement drastically changed. Only recently did I discover that most of my traffic is click bots. I can see them coming from various countries like India, Mexico and Spain. Also, I can see their site behavior and it is without a doubt, click bots. The problem with your test is that click bots are not always there. I ran my site for 10 months straight and never had a problem. Now, I can’t get rid of them. I have tons of hard proof that you can see for yourself. This is a HUGE story that no one is covering right now. Click bots destroyed my ability to advertise on Facebook and Instagram. I have reached out as best I can to Facebook but have not gotten an answer…nor do I think one is coming. We recently started advertising on Facebook on a large scale and saw countless bots that visit the advertised url more than once. We paused our adverts while we investigated and the bots continued to visit the same click URL for over a week after the advert was paused. I think that the largest problem is that unlike other advertising companies, there is simply no real support for Facebook ads. They expect you to pay for a service and they do not provide any useful support for the service that they charge you for. If you find inconsistencies, errors or are incorrectly billed, there is no one at all that you can reach out to for a resolution. Based on our experience, 80-90% of visitors from Facebook ads are not human. They visit the website, rarely move their mouse and then close the window. Around 40-50% of visitors repeatedly come back via the same clicked url from the facebook ad. Why would so many people be clicking on the same ad, sometimes 30 times within a few days, yet never click on another link within the website or even move their mouse? A huge swath of useless traffic was seen coming from Android users with Chrome browser. When we blocked this type of user, our fake traffic dropped considerably.